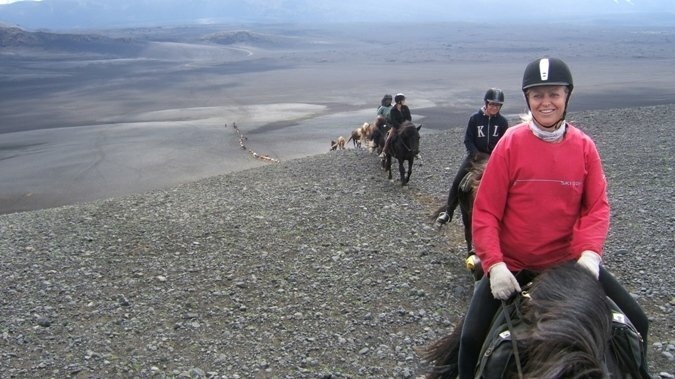 This eight-day excursion is an enjoyable horse riding trip that provides an excellent opportunity to see some of the main natural phenomena of Southern Iceland. 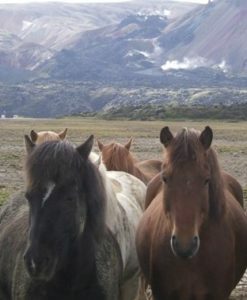 This eight-day excursion is an enjoyable horse riding trip that provides an excellent opportunity to see some of the main natural phenomena of Southern Iceland. Þjórsárdalur, Háifoss, Gjáin, Hekla and Landmannalaugar are among the places we visit during this excursion. 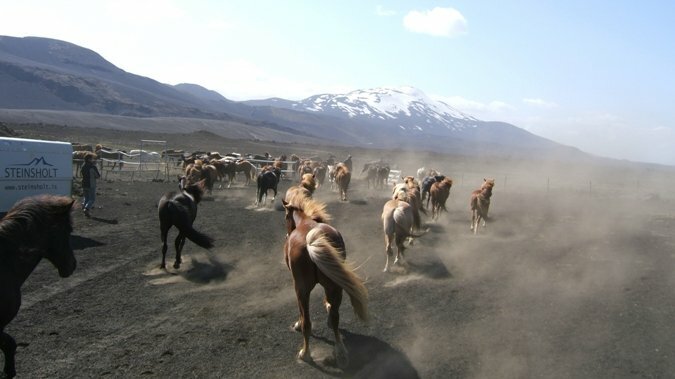 You can walk in the soft black sand at the roots of the famous volcano Hekla, where the landscape reminds you of the moon, and bathe in the hot springs of Landmannalaugar which were crafted by nature’s hand. 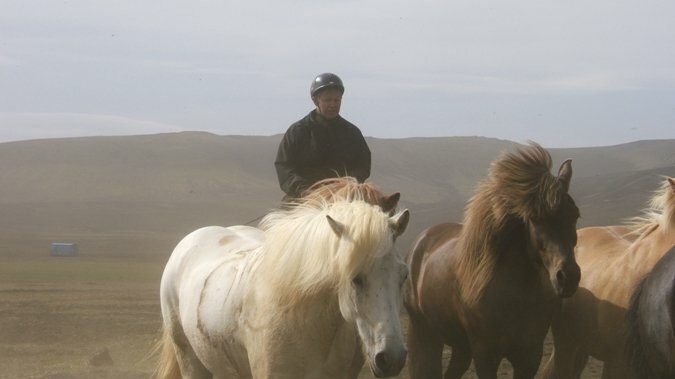 This excursion is only for experienced riders. 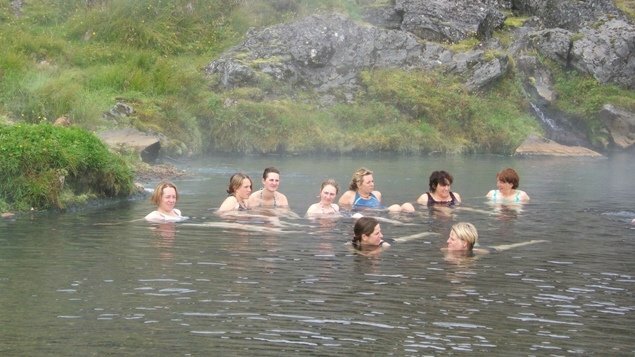 The price of this excursion includes transport to and from Reykjavík. During the ride full board is provided. 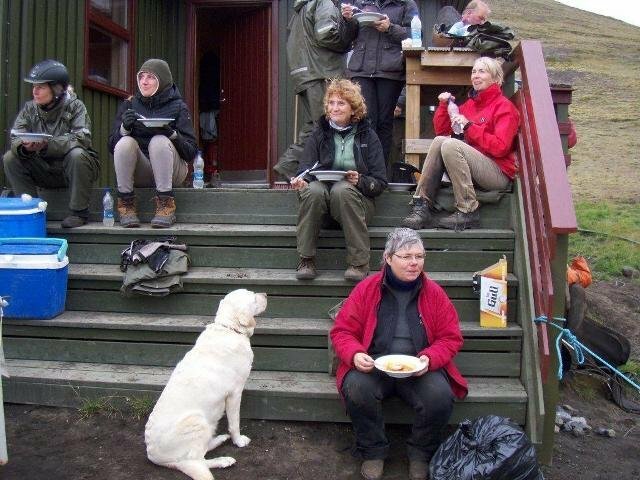 Our menu consists of a large breakfast and traditional Icelandic meals (fish or lamb). Vegetarian meals are available if requested when booking. All riders make their own packed lunch from the breakfast table. Alcoholic beverages are not included in the tour price and are hard to get in the highlands. They can be bought at a reasonable price in the Duty Free Store at Keflavik Airport upon arrival. Rain wear, water bottle, saddle bag, riding helmet. Individual travel insurance is not included in the tour price. 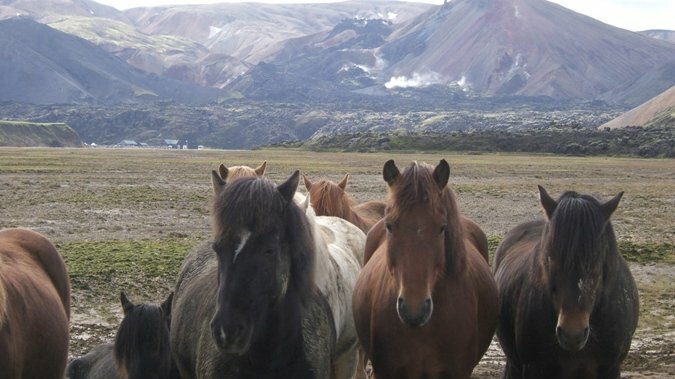 We encourage clients to obtain relevant travel insurance before visiting Iceland. In step 2 in booking, you can choose to pay now 30% to secure seat and pay rest, at least 6 weeks before tour starts, or pay in full now. After your arrival at Keflavík International Airport, you take the Flybus to the B.S.I. bus station in Reykjavík, where you will be met by one of us and transported to Horse farm. 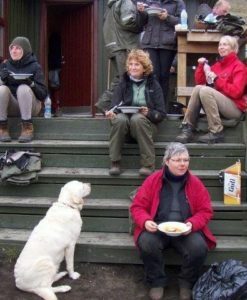 In the evening your group will be served dinner and we will have a look at the travel schedule. After dinner, you can relax in our hot tub before you retire for the night. 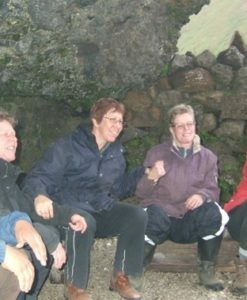 Upon departure ,from Hallarmóli we head to the highlands, and we climb up to mountain Ísarhrygg. 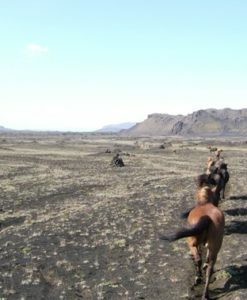 From there we ride to the Háifoss waterfall. 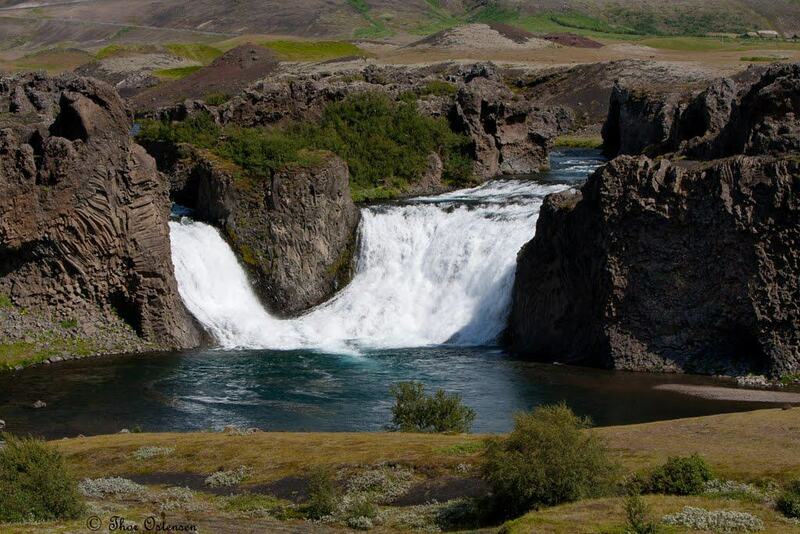 Háifoss is 122 meters high, which makes it the third highest waterfall in Iceland. There we try to stop so we can have a closer look at it. 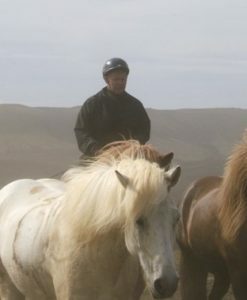 Then we ride to a very nice cabin called Hólaskógur. There we have a possibility to have a warm shower. Distance: 28 km. 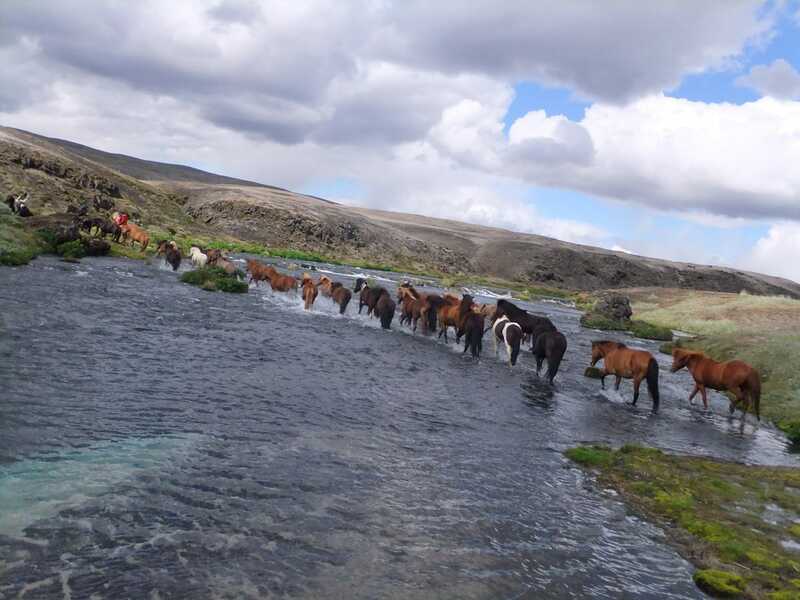 Departure from Hólaskógur on horseback and across the river Þjórsá, the longest river in Iceland. 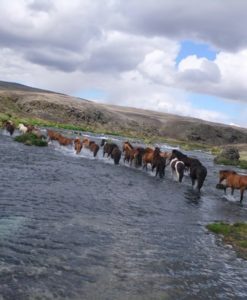 Then we ride along the river for about one hour, after that we stop and change horses and maybe we are lucky and get some coffee too. 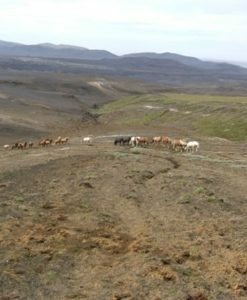 Then we ride on the north side of Vallafell and from there on to the lower slopes of the 1074 meters high mountain Loðmundur. 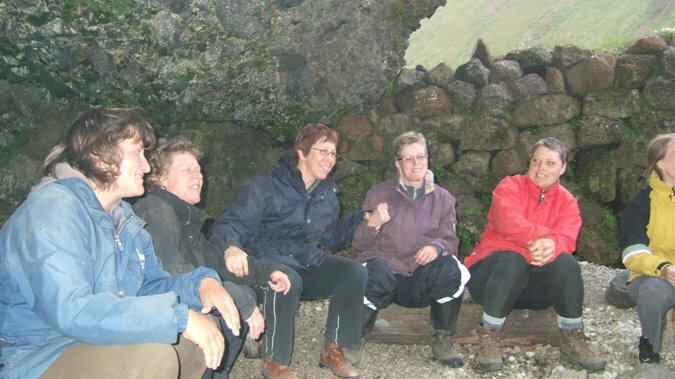 We stay the night in Landmannahellir, a well-equipped cabin sheltered by the surrounding high mountains. Distance: 34 km. 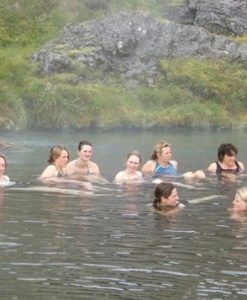 The fifth day we travel from Landmannahellir to Landmannalaugar where we stop for about 3-4 hours and you can explore the surroundings and bath in the hot springs. 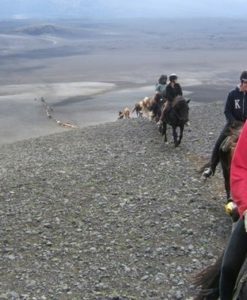 Then we continue on horseback back to Landmannahellir where we spend the night again. This is a day with a little faster-riding pace. 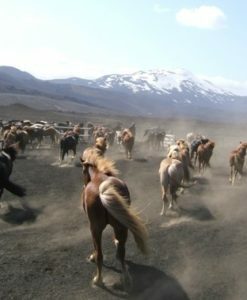 The horses love to go in the black mix of sand and ash. 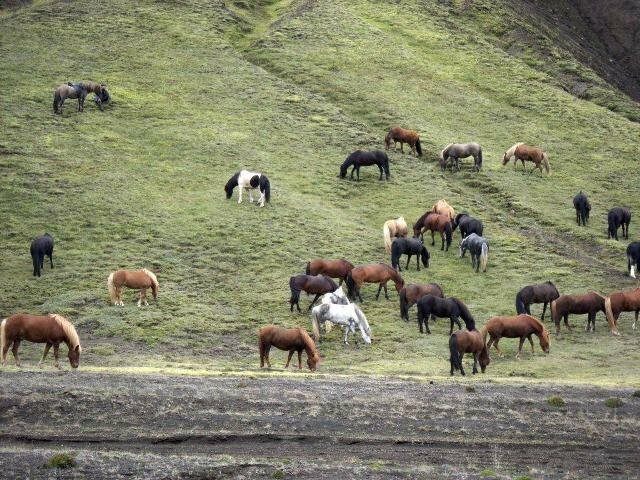 This is one of our favorite parts of the tour, you can almost hear the horses say “Yay, this is so much fun!”. Distance: 40 km. We go from Landmannahellir and follow a trail that lies south of Vallafell. 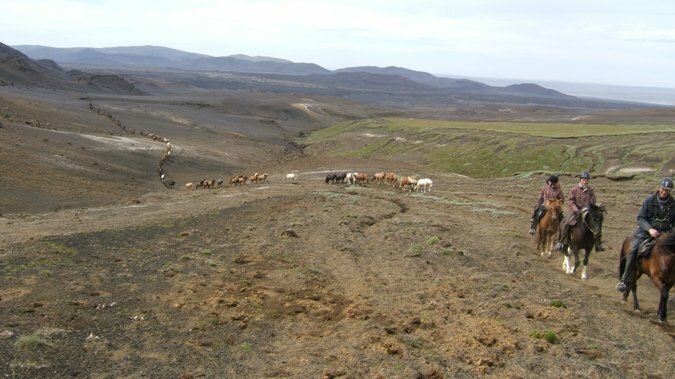 This trail lies close to the volcano Hekla where the surrounding landscape has been formed by the past eruptions. 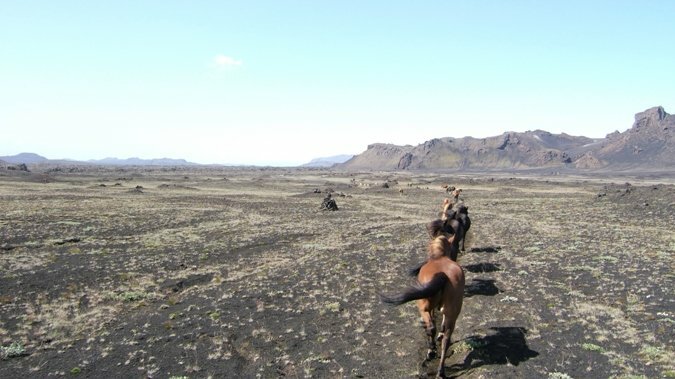 The lava and black pumice sand make an enjoyable riding trail through this barren and savage landscape. We stay the last night in Hólaskógur. Distance: 34 km. This is the last day on horseback. We travel from Hólaskógur through Þjórsárdalur where we see Gjáin and Stöng, and then continue riding through the woods in Þjórsárdalur. The day ends with a dinner at our horse farm where we relax and enjoy ourselves together. Distance: 39 km. After a well rested night in the excellent beds of horse farm we head to Reykjavík where the journey comes to an end. Tophorses requests a confirmation payment upon booking of minimum 30% of the tour price. When the confirmation payment is received the seat is secure. The remaining balance in ISK is due 6 weeks before the tour departs. If you book the tour through the website you can choose in step 2 in booking to pay 30 deposit or fully pay. Children’s under 12 years receive 25% discount on our multi-day tours, where tours are recommended for younger children. 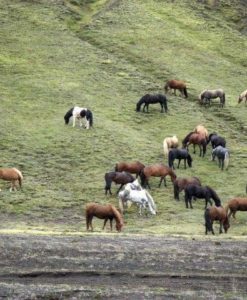 Tophorses reserves the right to alter routes, itineraries or timetables without prior notice, should the necessity arise. No liability is accepted for loss or expenses due to delays or changes of arrival or departures of flights or other services, injury, sickness, accident, strikes, damage, negligence, weather, wars or other causes outside the control of Tophorses. All such losses and expenses are the personal liability of the traveler. The estimated duration of tours as indicated by km or timing can change according to road or weather conditions. articles are washed and cleaned with iodine. 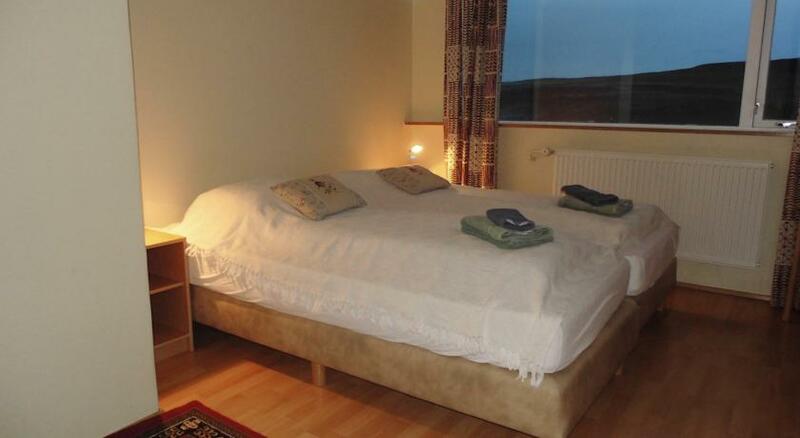 With far-reaching views towards Eyjafjallajökull, this guest house offers homemade food. 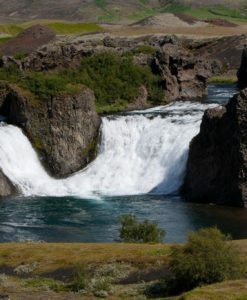 Selfoss is only 40 km away, and the iconic Gullfoss waterfall is only 52 km away. 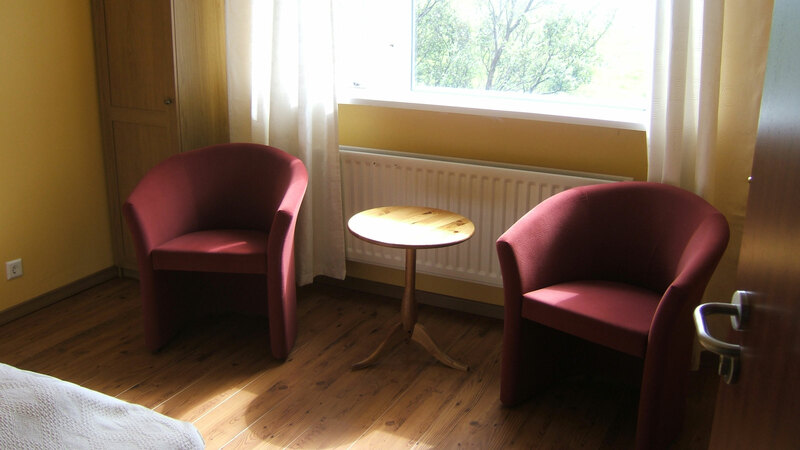 Guesthouse Steinsholt provides free Wi-Fi in public areas and advice on arranging local activities. The property has its own hot tub and an outdoor terrace for guests to relax. Each bright room has a modern décor and comes with either a private bathroom or shared bathroom facilities. All rooms do come with their own wash basin. A breakfast buffet is served at Steinsholt featuring homemade bread and produce from the owners’ farm. Dinners can be served on request, with lamb being a speciality. The famous site of Geysir is 46 km from the property, while Thingvellir National Park is 72 km away.